Instagram TV, aka IGTV is Instagram’s new baby. It’s a vertical video platform that provides a ton of scope to connect and engage your audience. There’s been a lot of buzz around it since it’s lift off on June 20th. As we’re all in this together I’ve done a bit of research and trawling to give you the low down. So you can onboard and upload like the Flash (if you’re DC), or Quicksilver (for Marvel devotees). Mobile first: IGTV is built for how you actually use your phone: vertical and full screen. Simple and intuitive: It starts playing as soon as you open the app. You don’t have to search or browse to get started, and it’s easy to multitask. 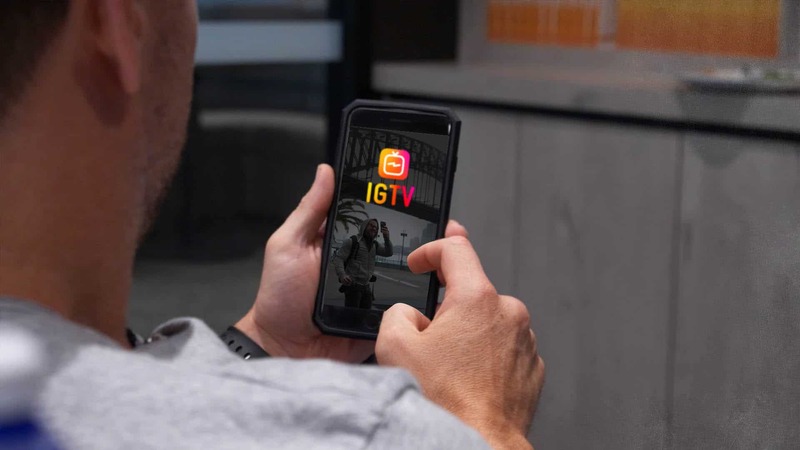 Curated: IGTV is focused on the creator’s you love most and already follow on Instagram. IGTV can be downloaded as a standalone app or accessed via the existing Instagram app as long as you have updated it since it launched. It allows you to introduce longer-form vertical content to your audience, and even build your own TV channel and will connect you to people you follow. You can follow someone new by tapping the ‘+’ button on their channel profile. Now we can create videos that are 10 minutes or less, however, verified accounts can upload material that’s up to an hour long. With the focus on longer-form video content this is a game-changer for long-form content creators. So how can you get maximum benefit from this new format? IGTV lends itself to; IGTV exclusive content, Q & A’s with industry leaders, video meet and greets (who you are and what you do), product demos/tutorials, recurring segments, webinars, and repurposing content. Even in its infancy, IGTV looks to become a versatile platform for all, however especially for savvy entrepreneurs and videographers, to create rich and credible content to grow social media community engagement. Maybe even increase revenue along the way for some. All you need to do is get on it, and get on it NOW. It’s still early days, and being one of the first on this will ensure you gain traction, engagement and new followers from the get go. The big plus for business is that IGTV lends itself to developing a suite of value-add long-form, and instantly accessible content. Instagram co-founder and CEO Kevin Systrom says he hopes the new format will bring you closer to the people and the things you love. Instagram has always been a place to connect with people who inspire, educate and entertain. With your help, IGTV begins a new chapter of video on Instagram,” Systrom says following its release. I hope these basic IGTV starter-up tips have given you a level of confidence to begin and venture forth into IGTV land with some good options for its application. For inspiration, check out Kerwin’s IGTV channel and let us know what you think.